Showing 1 - 15 of 16 articles tagged "Younger"
The TV Land series returns on June 12. The Sutton Foster series will help kick off a new female-driven dramedy night on Thursdays that will launch next year. 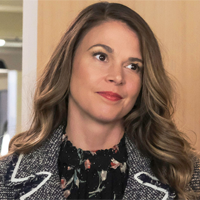 Sutton Foster on Younger's season finale: “This is from fantasy to reality in a matter of seconds"
The renewal comes one day before the Sutton Foster-starring series launches its fifth season. The TV Land series returns on June 5. He'll become a series regular on Season 5 of the TV Land comedy-drama.